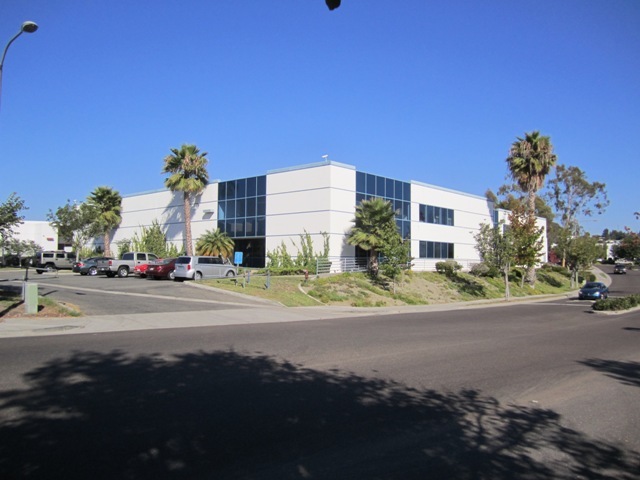 While it would be misleading to say San Diego County's generally still-slumping industrial real estate market is catching on fire, there's no denying a lot of investors and users are jumping on opportunities to pick up solid properties at down-market values these days. Although San Diego like many metro areas continues to struggle with uncomfortably high industrial-sector unemployment - and consequently vacancies as well - quite the bevy of businesses have purchased small-cap facilities over the past couple-three months. And real estate investors ranging from conservative to opportunistic have become more active as well. Or in some cases, the buyers are opportunistic investors that can also use the space at least until lucrative re-sale opportunities emerge with eventual marketplace recovery. A recent example is locally based real estate and hospitality player Golden Globe Group, which acquired a 28,900-square-foot facility being vacated on about 1.3 acres along Temple Heights Drive in the northern town of Oceanside, at a pretty attractive price equating to $58 per square foot. Golden Globe, owned by local entrepreneurs James Xiaokun Ye and Hu Hui Hua, was looking to complete a tax-deferred exchange through the transaction. And the selling group, the Enger family, was relocating automotive businesses in the building. Golden Globe, which a year earlier purchased the 45-room Quality Inn & Suites hotel on Highway 101 in nearby Encinitas for $3.28 million, is actively taking advantage of recession-eroded values in the Oceanside/Carlsbad vicinity, acknowledges investment broker David Temko with Marcus & Millichap, who arranged the sale. The property attracted lots of interest from users and real estate opportunists alike, but the substantial available industrial inventory in the area limited the "price per pound" a property being vacated could fetch, Temko relates. While the local economy is picking up and it's pretty clear better days lie ahead, small-cap investors are logically leery of paying big bucks for vacant buildings with tenant demand still generally weak, Temko continues. But some like Golden Globe's principals have the resources, wherewithal and "patience" to buy at "discounted" pricing, use the property for storage on an interim basis, then look to lease (or perhaps sell) as the market tightens and rents and values recover, Temko notes. "They will be sitting pretty at that point." That point appears to be at least another year away - perhaps more - given prevailing fundamentals. Overall industrial vacancies are still uncomfortably high at nearly 12 percent, according to brokerage Cassidy Turley. Vacancies within general/manufacturing facilities, which comprise about two-fifths of the nearly 175 million-square-foot marketplace, are in relatively decent shape at 8.8 percent. But warehouse vacancies are still above 13 percent, and the R&D rate is still well over 15 percent. That can't be too much of a surprise, as Moody's Analytics reports that the San Diego economy lost more than 10,000 industrial jobs in 2009 - and nearly half that many again last year. But the forecast is for recovery to start modestly this year, with gains of 3,000 to 4,000 or so the following two years. Meanwhile San Diego County continues to struggle with an unemployment rate hovering around the 10 percent mark. Employment in the wholesale trades has trended slightly positive over the past 18 months or so, but manufacturing has seen nearly 5,000 net job losses. "We need to see our manufacturing sector make a comeback," Temko understates. However the user-side marketplace is showing some signs of life with leases and property purchases. Cassidy Turley pegs net absorption for full-year 2010 at nearly 1 million feet - a welcome rebound after 2009's negative net far exceeding 4 million feet. Nevertheless the activity is yet to put any upward pressure on effective rental rates. Rents at small-cap San Diego County flex properties in January averaged about 86 cents a foot monthly, off yet another 7.5 percent from year-ago levels, according to Boxwood Means. With warehouse-type properties, rents average about 78 cents a foot, down 8.8 percent. On a couple brighter notes, construction has nearly halted, and some office users are now targeting lower-cost flex properties. While certain businesses have commissioned a few highly specialized build-to-suits, spec development will likely remain at the current virtual stand-still until much of the prevailing inventory gets absorbed, Temko observes. And now many small businesses are favoring lightly improved flex space over higher-cost offices, he continues. "They get a more favorable lease rate - and have room to store business and personal goods." On the sales price side, according to CoStar Group average local industrial and flex property cap rates have been flat in the mid-8s since mid-2009; they had bottomed out in the low-6s in 2007. A couple of recent single-tenant property purchases were presumably at the low end of the local cap rate scale. Mossmer Family Trust paid $1.5 million cash for a 12,300-square-foot single-tenant distribution center along Formula Place in the high-demand north-central submarket of Miramar. The $122 per foot reflects the strength of a Miramar location as well as the property's tenant, multi-market operation SSF Imported Auto Parts Inc.
Out east in inland El Cajon, local investor John A. Cameron paid a bit over $92 per foot for a 26,000-square-foot Raleigh Avenue facility serving as a distribution center for another major chain: HDS White Cap Construction Supply. Many generally cautious investors seeking a decent yield these days evaluate industrial properties "100 percent" on existing tenancies and term lengths, Temko relates. "There's strong pent-up demand for industrial and flex properties leased to credit tenants on a long-term basis - but there's not a lot of inventory."